This month’s poll results revealed some very interesting details on what administrators are looking for to support their SQL server environments. Of those polled, 33.6% stated they want SQL configuration settings audited. 22.9% expressed the need for security auditing such as logins and role change events. Another 15.7% stated they desire auditing of data changes. In total, more than 72% require SQL auditing to perform these top-3 purposes. Most of these features and more are found in the NetWrix SQL Server Change Reporter. For one-third of respondents to indicate configuration settings are their highest priority reveals that SQL servers can suffer harm when their configurations are changed. This can result in loss of data or availability problems. Organizations that rely on SQL to host their most valuable data need these servers to be as stable as possible. This can only be achieved through detailed SQL configuration auditing. Nearly a quarter of those polled need SQL security auditing. 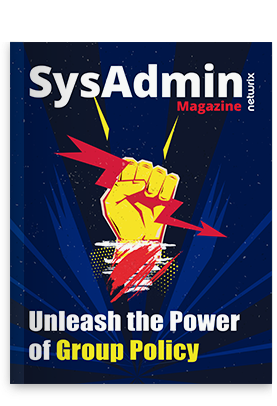 Users and administrators making changes pose a significant risk to the availability and integrity of this data and need their SQL login activity audited. Only detailed login and role auditing can assure an organization that there is a documented trail of information to not only secure this information but also to sustain accountability. Not surprisingly, SQL data changes followed as an essential SQL auditing feature. SQL schema changes can wreak havoc. Most administrators whose environments rely on SQL can attest that the worst problems strike at the closing of a month or quarter. Not knowing who changed what table, column, view index, or stored procedure where and when can frustrate users and senior management and cost hours of troubleshooting. 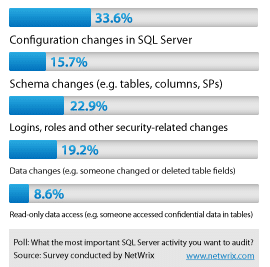 Having a detailed audit trail of who changed what, when and where, including before and after detail is exactly what NetWrix SQL Server Change Reporter delivers. These top-3 needs reinforce why SQL auditing is critical especially to those organizations that rely on it. Windows natively cannot offer the level of detail provided by the NetWrix SQL Server Change Reporter nor can it store this change information for multiple years to sustain compliance efforts. These reason and more illustrate why so many customers rely on it each day to maintain these mission-critical data stores and protect them from harmful changes. If your environment relies on SQL, you must give SQL Server Change Reporter a try. Best of all, like many of our products, it’s available also as freeware with many powerful features. How much would your organization suffer if a bad SQL change went undetected? How sensitive is your environment to SQL service interruptions? Please share any thoughts or comments below. Removable media: Convenient portable data storage or IT threat?